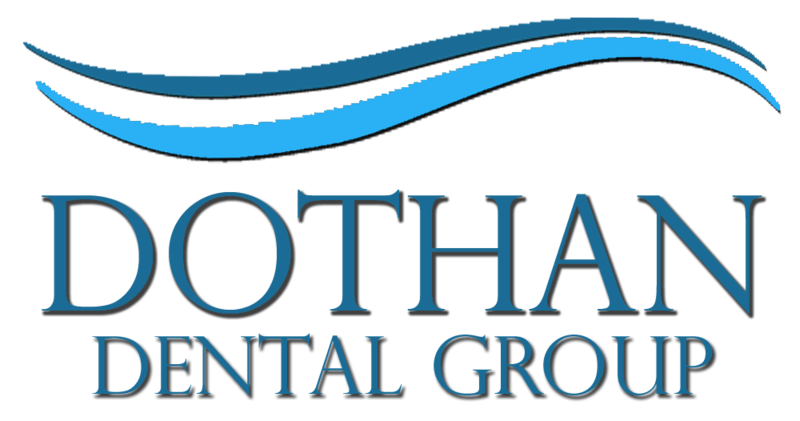 Dental crowns and bridges are two of the ways that we repair and replace damaged and missing teeth at Dothan Dental Group. Crowns and bridges have some distinct advantages over other options. For example, unlike dentures or partials, crowns and bridges do not need to be removed and cleaned because they are attached to existing teeth (or implants!) and are cleaned in the same way as your own natural teeth. A dental crown is normally used to cap or cover a tooth that has been damaged. Aside from strengthening the damaged tooth, a crown will also improve the tooth’s appearance, alignment, and shape. Crowns can also be placed on dental implants to replace missing teeth. Ceramic and porcelain dental crowns can be created to match the exact shade of your teeth, which helps to improve your overall appearance. Crowns can also made from other materials including acrylic, metal alloys, and gold. In most cases, alloys are stronger than porcelain, and they are commonly used for teeth in the back of the mouth. In many situations, porcelain is bonded to a metal shell, which provides even more strength. We’ll discuss these options with you to help determine which type of crown best meets your needs. Come see why hundreds of families come back to our practice for General, Cosmetic, and Restorative dentistry in Dothan, AL! Always had a good experience. Everyone there is professional and enjoyable. Would recommend to anyone.